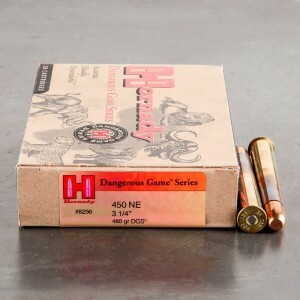 450 Nitro Express ammo is one of the most powerful shoulder fired rounds in the world. The 450 Nitro Express is a cartridge perfect for hunting in the savannahs of Africa. The round is capable of taking game up to elephants and if something larger existed, the 450 Nitro Express could take it out too! This cartridge is a straight-case design that is over 3-inches in length. The 450 Nitro Express was designed by John Rigby and is derived from the older 450 Black Powder Express round.